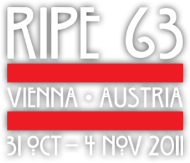 As more and more people in the RIPE community now have young children, some of the parents have come together to form the Parents’ Group, a forum to discuss family-related activities during and around RIPE Meetings. The group will enable the RIPE community’s parents to talk about ways to combine family life with work during the RIPE Meeting week. The Parents’ Group mailing list is open and anyone can join the discussions. Subscribe to the Parents’ Group mailing list or send an email to ripe-parents-request [at] ripe [dot] net with subject line “subscribe”, no body text. Harald Michl from ACONET (left) and Vesna Manojlovic (right) are the happy parents that can guide you through the RIPE Parents’ group. A tour of the Vienna Zoo for parents and children is planned for Saturday, 5 November, at 10:30 local time for 30-45 people. Anybody interested in joining can send an email to the mailing list.